Ladies, take heed. REAL weight training is imperative if you want a toned, sleek body. Take it from me, women don’t naturally have the testosterone necessary to build huge muscles … steroids are what make the women you see in professional bodybuilding huge. 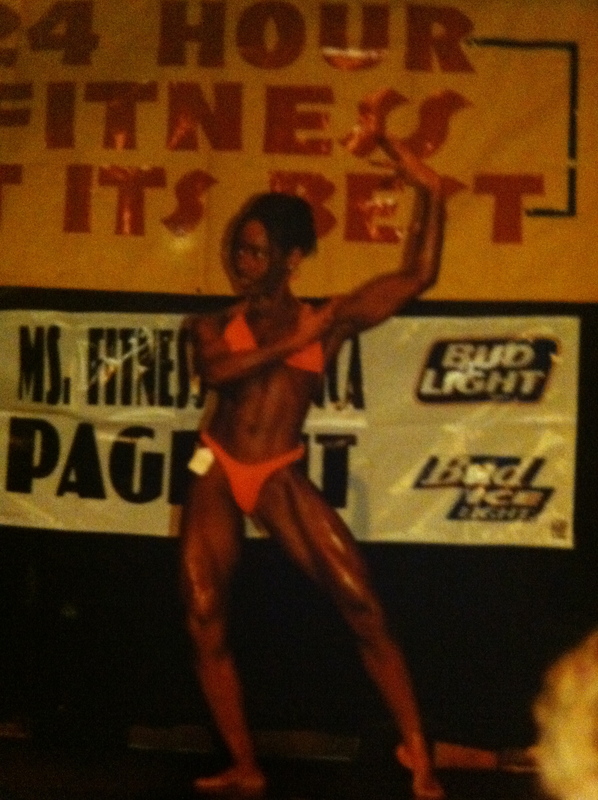 When I competed, I could deadlift and squat over 200 pounds … and I weighed 105 lbs. I was the skinniest I ever was in my life. The reason I am toned when I lose weight is because I always incorporate resistance and increase the weight when it becomes too easy. You need to burn out the muscle … if you can do 20 reps for 3 sets … time to up the weight … significantly. Shoot, I’m trying to write my own post on this! LOL!! Check this out … it’s great information! Progressive resistance is crucial to any women’s strength-training program. Once your muscles adapt to a given exercise, you need to increase either the resistance or the number of repetitions to promote future gains. Begin with a weight that allows you to do a minimum of eight repetitions of a particular exercise. Once you are able to complete 12 repetitions with that weight, you should increase the weight by about five percent. At this point, drop back to eight repetitions with the heavier weight. Once you’ve worked up to 12 repetitions with the heavier weight, you increase it by another five percent. The recovery process between training sessions takes at least 48 hours. Because of this, your strength -training sessions should be scheduled no more frequently than every other day. If you enjoy training more frequently, avoid hitting the same muscle group on consecutive days. You look amazing and very feminine! I would have never thought you lifted weights! You look great! Shelli you totally rock girl! I absolutely love weight training. I have a personal trainer who helps me with my weight training at the gym. I also buy the Oxygen magazines and rip out the strength training routines I like for my ” files” and motivation when I want to do light weights at home. I am in my late 40s and I know that I am 10x stronger than the youngsters I work with and my younger relatives. I am pear shaped and still have booty and thighs, just toned. My goal is to be healthy as I age and not break any bones! You’re right, you have to be taking some serious steroids to look masculine. Awwww, thanks ladies!! Queen, I definitely am heavier on my lower half, but lean more towards hourglass than pear as I have wide shoulders and a V shaped back. But, my goal is the same, I just want to be as healthy as I can be as I get older. I see those weekly pill cases that older people have and my mind is boggled!! I’m trying to avoid that as much as possible. I know also that if I don’t control my sugar intake, I’ll end up diabetic. So, that’s a big incentive as I don’t know what I’d do if I ever had to give myself a needle!! LOL @ Funlayo!! Yeah, we will NEVER look like Arnold. Arnold wouldn’t have looked like Arnold without all of those steroids!! Hi Dani. No, never did P90X. I ordered P90 when VHS was still common;). But, I never did them too much. A few of my friends have done P90X. It’s like the precursor to Insanity … not my thing. I did my crazy working out when I competed. Now, I like to be challenged, but I don’t want to go to the extremes that make me crash once I’m done. Even when I’m doing moderate like I do now, I still burn out. So, I try to avoid that.